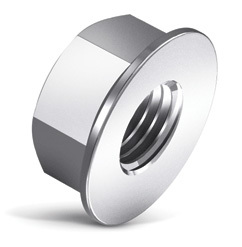 Free spinning installation eliminates the need to wrench the nut down the fastener. Grade 8 strength and quality, but will work with any grade fasteners. Does not damage threads or plating on fasteners. Hardeness of 28-38 HRc - More effective at maintaining clamp load under vibration. Spinner grips are not limited to 5 reuses, as are most prevailing torque lock nuts. Note: Additional charges apply to plated product. Charges vary by plating type. To Place an order CALL US NOW!